Procter & Gamble laundry brand Ariel is running “Share The Load”, a campaign encouraging men to take their share of the household chores in India. Launched in 2015, the campaign began with the question, “Is laundry only a woman’s job?”. 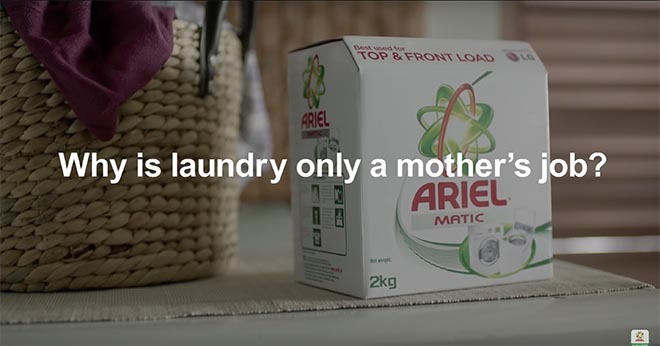 Ariel laundry packaging was released in the “His and Her” pack. Working with clothing brands, Ariel took the message to wash care labels. A commercial featuring two women reflected on the halting progress being made in household equality. 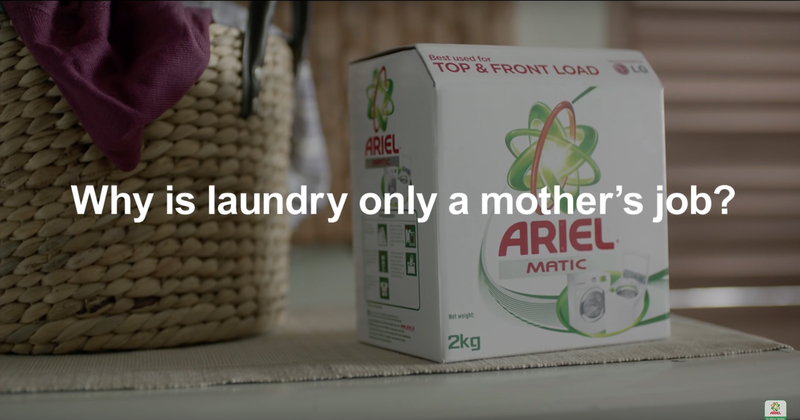 And now, in 2016, Ariel has gone viral across the world with a second Ariel Share The Load commercial in which a man writes an apology to his daughter for his failure to challenge patriarchal attitudes to housework. The commercial ends with his own personal action in sharing the laundry load with his wife. The Ariel Share The Load campaign was developed at BBDO India, Mumbai, by chief creative officer Josy Paul, CEO Ajai Jhala, executive creative director/copywriter Hemant Shringy, creative director Umma Saini, agency producer KV Krishna, planners Rajat Mendhi and Mannish Sain, account managers Rohit Chatterjee and Nilza D’Mello. Filming was shot by director Shimit Amin via Red Ice Films, Mumbai, with creative Nisrin Aziz, executive producer Vandana Singh, producers Gary Grewal and Richa Krishna Lal, director of photography Sylvester Fonseca. Sound was produced at Riversound. Editing was done at Prime Focus by Niles Girdhar and Vishal. Telecine was produced at Nube Studio by Navin Shetty.